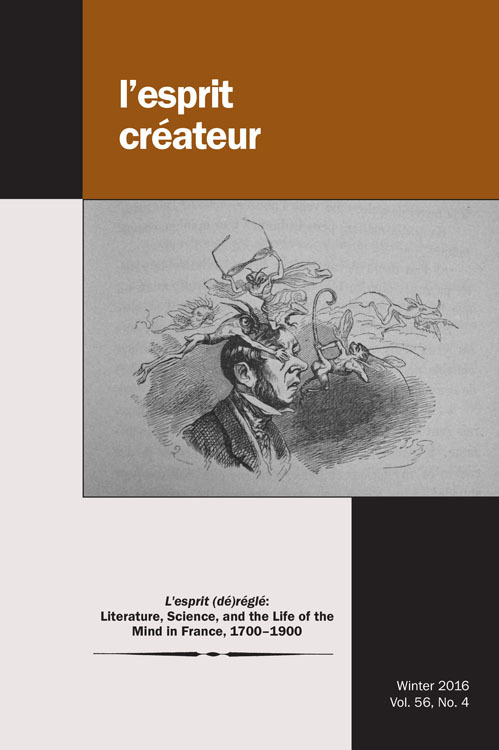 As reported over on the h-madness blog the Winter 2016 special issue of L’esprit créateur is dedicated to “L’esprit (dé)réglé: Literature, Science, and the Life of the Mind in France, 1700–1900.” Full details follow below. The case studies presented in this special issue illustrate the unique appeal that the puzzle of the mind exerted across fields of knowledge in the eighteenth and nineteenth centuries. They highlight the diversity of approaches and perspectives that the exploration of the mind elicited in literature, philosophy, and the sciences de l’homme. They also testify to the conceptual challenges and persistent nebulousness that surrounded the notion of esprit and its close associates. That fluidity of meaning was, in its way, productive: it provoked debates about the nature of the self, the precarious status of consciousness, and the relevance of human exceptionalism. This article proposes a commentary on a little known novel, Les Amours du chevalier de Faublas, written between 1787 and 1790 by Jean-Baptiste Louvet de Couvray. The objective is to show a rivalry that existed in the second half of the eighteenth century between the novel and medical treatises as ways to document knowledge of the human mind. Taking as a point of departure the problematic polysemy of the term “esprit” in the eighteenth century, this article reveals how Couvray’s novel engages in therapeutic writing. Its main hypothesis is that as a fictional narrative, the novel discusses the madness of love and the disturbances of the mind.